In 1947, my grandmother fled Lahore, Pakistan during partition. She left for India by train at night with fires burning outside her window. Seven years later, at age twenty-one, Nani married my grandfather. My grandfather was a mapmaker who spent the next thirty years charting the new India-Pakistan border in exquisite detail. My grandparents gave birth to my mother. She grew up traveling with them along the India-side of that border, through mountain hills stations and desert sands, before eventually earning a degree, migrating to America, and giving birth to me. In 2007, sixty years after my grandmother fled Lahore, I became the first member of my family to return. I was reporting for The Washington Post – traveling to twelve countries over the course of a year to write about how people perceive America. I wrote articles about lives touched by the U.S. – for good or ill – and my grandmother read my pieces with great interest. But none of them fully satisfied her. She wanted to know what her old neighborhood looked like, what life was like for her childhood friends who happened to have been Muslim, not Hindu, and did not leave sixty years before. Nani did not have a particular friend in Lahore. She just felt a curiosity for the place. I told Nani to be patient – that between all the tech giants, soon she’d be able to connect seamlessly with whoever she wanted, whenever she wanted. Together we imagined a future where she could touch down as a hologram on the streets of Lahore and interact with passersby. Nani passed away in 2009, but I never stopped waiting for Google or Skype to make that vision of the future a reality. By 2013, living in New Haven, attending law school, and preparing for a life of policy papers and punditry, I started wondering what life was like on those Lahore streets myself. I thought back on my days as a reporter and missed them acutely. In particular, I missed the long bus and train rides I would take on the road where my laptop would die, I had no smartphone, and there wasn’t enough light to read a book, so, to pass the time, I would strike up a conversation with the stranger riding next to me – someone far different from myself. I missed talking to a father trying to find a distant daughter in the Philippines, a young man in Pakistan heading to madrassa, keen on becoming a computer scientist, an aging revolutionary in Mexico on pilgrimage, preparing for his final days. These conversations in the evening light were “de-instrumentalized” or “purposeless” conversations across pronounced distance. In my life in the U.S., at law school, networking, dating, and socializing, I realized I rarely encountered people I did not already know. And when I did encounter them, it was always to get a date or land a job. Meanwhile, technology was racing ahead, which made calling Lahore as easy as making a local call. But these online tools were not really solving my problem. I was networking on LinkedIn, dating on Tinder (yes, I admit it), and posting glossy pictures of the joys of my life (and not my sorrows) on Facebook. Chatroulette, which lets you talk to strangers around the world from your laptop, popped up too many drunk people and exposed penises to remain enticing. And if I received a random Facebook friend request from Pakistan asking to chat, I assumed it was spam, a virus, or worse. Even on the bus or train at home in the U.S., I never really talked to strangers. I watched a TV show on my laptop, talked with a friend by phone, or read a book on my iPad. I was never “lost” without one of these devices handy and charged. I had not had a conversation with a stranger for no particular purpose in many years. I had almost forgotten the feeling of exiting my world, losing myself in the vastness of our human experience, and listening attentively to the stories of another. So, trying to fill this longing, I began to tilt away from law and policy, and toward art. This tilt, which has now become a full turn, brought me to Portals. In the following pages, I will, first, tell you what a Portal is; second, explain how the initiative grew from a small art experiment between Tehran and New York into a global public art initiative; third, share some of the early lessons we’ve gleaned over the past two-and-a-half years about the power of purposeless conversations, and, finally, offer a vision for the future of public spaces around the world. Portals began as a daydream. We’ve all read stories about people walking through a mirror, fireplace, cabinet, pond, tollbooth, tree hole, rabbit hole, and so on…and emerging in another world, a different time, another space. More prosaically, I wondered: What if you could enter a door at the back of your local coffee shop in the morning, and see live into Lahore, Pakistan? What if you could share your morning coffee with people sipping their evening tea across the world, as if in the same room? I started turning this idea over in my mind all the time, and talking about it with everyone who would listen. I got mixed reactions. The negative reaction was “We already have this; it’s called Skype!” But then there was the reaction that made the whole initiative possible: a subset of people who were deeply invigorated by the idea, and jumped into action. Together, over 2014, these people helped discipline the daydream until it took physical form. One of the first people to jump into action was my partner John Farrace, an architect by training. Together, we addressed the first form of discipline – the structural. Would we connect coffee shops? Other pre-existing spaces? Or create new ones? I considered tents, inflatables, and sheds, before choosing a standard intermodal shipping container. These containers are relatively affordable, omnipresent, easily securable, and uniform. They are also symbolically rich: Etched in each old container are the markings of its movements across time through ports around the world. With that decision made, I did what my parents had long dreaded. In August 2014, I broke the lawn fence in their backyard and dropped an old 6-meter-long container on the grass. They weren’t thrilled, but it was the neighbors who were absolutely livid. They complained to the local police – first claiming I was living in the container (I was not) and then insisting that it was an eyesore regardless. On the latter point, I agreed. So I tried painting the Portal different colors to dull their rage and spark their imagination – white (too artsy) and black (too scary, like a black site). I tried stripping the paint to buff and shine the underlying metal, but this was terrible for the environment, unhealthy, and costly. Silver looked too precious and light gold too much like money. Finally, I tried a dark gold that struck. It connoted more of the sacred than the commercial. And it had a reflective sheen to it, in which passersby can see themselves, but imperfectly. Inside the Portal, I wanted people to feel safe and protected, so I covered the whole interior, walls and ceiling too, in grey carpet. And at the far end of the container, I installed a small camera in a drywall door, working with my uncle, who is, conveniently, an optical scientist, to address perspective distortion. The rest of the technology was hidden behind the wall, save for a projector, speakers, and microphone. So when you enter the gold container, you come into a grey space, and, on the far wall, see a projection of the interior of the identical Portal abroad. 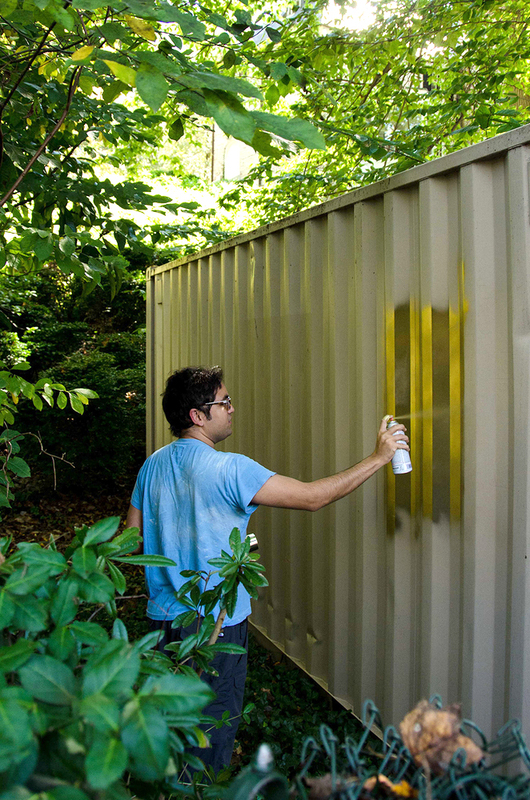 As a final touch, to signal what this gold box was, we put a stencil on the front of it that read, “A Portal to Iran.” This was too much for the neighbors, one of whom called the FBI to report a possible “terrorist cell”! The FBI investigated the container, and me, for a couple days and ultimately determined that the gold box was not a terrorist cell, just a Portal. The Portal was cleared. The structure was ready. Now we needed to determine the paired locations. I had wanted to connect an arts space in the U.S. to a place in the Middle East or South Asia. Since my grandmother passed away, I didn’t have a particular place in mind. But Michelle Moghtader, my earliest partner, knew exactly where she wanted to put one. Michelle is Iranian American. In 2014, she was a journalist reporting in and out of Tehran for a U.S. news outlet. Her reporting was always on nuclear negotiations and oil. In Tehran, she saw their press covering the U.S. in similarly narrow ways. Michelle knew there was so much more to both America and Iran. She wanted her friends in both countries to see that too – to see beyond what the press was giving them. When I told Michelle, who I knew from my days in journalism, about the idea for Portals, she jumped highest. Over the course of 2014, Michelle went to Tehran numerous times to identify a partner for our launch. She faced opposition, concerns about the government, Internet speeds, and about connecting to the U.S. But she persevered until she found the perfect partner -- Sohrab Kashani, the artist and curator behind the Sazamanb Center for Contemporary Art. Sohrab’s work was also about grounding technology in physical spaces to create unexpected encounters across distance. For example, after being denied a visa to the U.S., Sohrab hired a stranger to walk around the streets in the U.S. wearing a live microphone and web-camera and acting as his human avatar. Sohrab saw through the stranger’s eyes and spoke through the stranger’s mouth. “Hello, this is Sohrab from Tehran,” the human avatar would say for Sohrab as it walked through Central Park. Sohrab had created his own hologram abroad! Sohrab got Portals right away. He built an identical interior Portal space in Tehran. And by December 2014, we had two Portals set up – one in an experimental arts space in the Lower East Side of New York City – and the other in Tehran. It was launch time. The first few days were quiet so after we put one man in for a session in New York and no one else showed up on our end, we forgot about him altogether. Two hours later, he startled us all by popping out of the Portal! He had spent all that time with a stranger in Tehran and came out and wrote a long essay in gold pen, in our gold book, about his experience. His conversation began with a discussion of getting to work – how minimal traffic would make his day a good one. A march protesting the death of an African American man named Eric Garner at the hands of the police had snarled Manhattan streets. Meanwhile, in Tehran, the pollution was so terrible that it was virtually impossible to walk outside. The city was at a standstill. The personal and mundane – trying to get to work – instantly tied in the political. And the political instantly implicated the personal, as the men talked about sexuality, marriage equality, and ailing parents. They stopped only because the Internet in Tehran, which is not the most reliable, cut out. As days went on and we got busier, we found nearly everyone wanted more time in the Portal, in both Tehran and New York. So we increased the base time to ten minutes, fifteen and then twenty. We still had to pull people out. Even more surprisingly for us, participants came out from the Portal in both locations deeply moved – some were weeping; others were giddy; and everything in between. Then, many of the people who experienced the Portal on both sides came back with particular ideas for what they wanted to do in it next. The ideas spanned the gamut. So after four hours per day or so of one-on-one conversations, we started letting people take ownership of the space, and we were blown away by what they did: An Iranian America dancer named James Koroni had never visited his family in Iran. James’ father had a troubled relationship with Iran and never spoke about it. But through the Portal, James was able to perform his art live, as if in the same room, with his family in Tehran. He shared with them something deeply personal and came away in tears, saying he felt like he was breathing the same air. School groups came in to have a substitute teacher from Tehran. Film directors in both countries talked about the challenges of upholding a creative vision when arrayed against economic, political, and social obstacles. A jazz musician in the U.S. created a new musical piece with a classical Persian musician in Tehran. Over the two weeks, the crowds grew, some celebrities showed up, we attracted press, and then the Portals exhibit was over. Michelle and I regrouped. What had just happened? We expected the Portals experience to be neat, unexpected – maybe cool. But we were surprised to find it had such an emotional effect. The power of purposelessness also opened up the space so participants could create their own uses for it, like the dances and dialogues. The association of art enabled Portals to act as a public space. Looking back on it now, I think Portals hit a nerve because of several different factors: First, the conversations were one-on-one. Participants could not hide behind the most talkative member of a group. Each side was half responsible for making the most out of their time together. Second, the conversations were private, decreasing the pressure to perform. Cell phones don’t work in the Portal. Nothing is live-tweeted. Participants are unlikely to see their counterpart abroad again, so whatever they say is not likely to make its way back to friends at home. Third, the conversations felt relatively natural. Instead of talking to a disembodied head on a computer screen, participants spoke to a full, standing human being – fidgeting and swaying – and made direct eye contact, unencumbered by goggles or headphones. Fourth, the encounters felt rare. Because we connected Tehran and New York, we tapped into an evocative distance. The pairing forced people to think of the connection as in itself rare, a bit like receiving a pen-pal letter in the past after a one-month wait. Fifth, and most importantly, the context for the Portal encounter was in the world of art. That meant that it didn’t carry with it a single, particular purpose. There was no action-item after the talk – no “Swipe Right” to stay in touch or “Swipe Left” to reject. There was no bottom line goal to increase empathy or grow a user base. The encounter itself was contextualized as art – to behold. It could bring joy, irritation, pleasure, disgust, insight, or boredom…. No particular reaction was determined. The power of purposelessness also opened up the space so participants could create their own uses for it, like the dances and dialogues. The association of art enabled Portals to act as a public space. Michelle and I knew we were on to something and decided to devote ourselves fully to the effort. Together, we started responding to people around the world who were reaching out, hoping to place their own Portal. Just a couple weeks after the NYC-Tehran Portal closed, we got an email from Herat, Afghanistan. A computer science professor, Omid Habibi, had heard about Portals on BBC Persian and wanted one at his university in Herat, Afghanistan. We spoke on Skype a couple times and Omid got to work. He picked out a shipping container, brought it to his university, carpeted the inside, painted the exterior gold, and installed the tech. A couple weeks later, he hosted an opening event for the city. Herat was our first permanent Portal in the world. It has been running since March 2015, connecting with all our sites, including the U.S. and Iran. In the U.S., in Washington D.C., we had a drone pilot who flew soirees over Afghanistan for years enter the Portal and speak, for the first time, to someone on the ground in Afghanistan. We also had a former Department of Defense worker write: “In the four months I was there, I never had a connection with an Afghan citizen that was close to as powerful, as moving, as I did standing in that gold box. I was moved almost to tears…. In Afghanistan, when I was there, everything was deliberate. Everything was planned.” We had men and women in Afghanistan who had never spoken to someone of the opposite gender one-on-one in the same room before do so through Portals. We had people in Herat celebrate Eid with others around the world. Entrepreneurs shared ideas with other creators and funders around the world. After Herat, we placed about two new locations per month throughout 2015. As of August 2017, we have more than two dozen sites around the globe in Afghanistan, Cuba, Germany, Honduras, Jordan, India, Iraq, Iran, Kenya, Mexico, Myanmar, Pakistan, Palestine, Rwanda, South Korea, Spain, United Kingdom, and the United States. Portals exist at wildly diverse locations from modern art museums to refugee camps, from inner city U.S. to a tech hub in Gaza City. Each of our Portal hubs connects to every other. Each hub is staffed by a full-time Portal Curator who provides live interpretation, engages his or her broader community, and helps program special events. Our Portal Curators act a bit like global concierges or program managers, and help people brainstorm unique ideas and realize them around the world. They help locally community organize the world. 50,000 people have entered Portals since launch and had 20-minute, one-on-one conversations with strangers. Tens of thousands more have engaged in group events including classes, artistic collaborations, and performances. And we now have stacks of gold books filled with people's emotional reactions to their experiences. Across all these sites are so many stories, but one is particularly moving for me: We had an elderly woman in the U.S. who fled Cuba as a child re-engage with Cuba for the first time through the Portal. She was having a rough time; she was ill and feeling down. To cheer her up, her friend surprised her by bringing her to the Portal. The woman entered the Portal and spoke to someone in Cuba. It was the first time she communicated with anyone in the country since she fled decades before. And the stranger she talked to turned out to be a young man who grew up on the very same street that this woman did all those years before. The woman came out of the Portal dancing, laughing. But, also, with a tinge of the bittersweet. She reignited a connection toward the end of her life after all those decades had past. Then more than ever, I thought of Nani. Another person who visited a Portal in the U.S. and spoke to Havana was a professor at Yale Law School named Tracey Meares. After her conversation, we discussed creating domestic Portal pairings in the United States, launching with dialogues around the criminal justice system. Just a few weeks ago, we launched our first such pairing, connecting the 53206 zip code outside of Milwaukee, WI to downtown Newark, NJ. The Milwaukee site has the highest incarceration rate in America, which in turn has the highest incarceration rate in the world. Citizens in these locations are talking about their views of criminal justice, race, and the police. Participants include those who’ve been incarcerated numerous times, their family, the community, and police officers. In a first for us, these conversations are being anonymously recorded and transcribed so that researchers can analyze these dialogues to explore how communities construct their narratives on criminal justice. The researchers recognize that dialogue is the root of the formation of public opinion. A survey tells you what people feel. Dialogue tells you, in part, how they came to feel that way. We began Portals by connecting Tehran and New York, which invoked a substantial psychic distance. But the domestic dialogues emphasize how, in most cities, we could connect two sides of town because our local distances are often equally vast, with dialogue across them equally rare. Portals then is not about great geographies. Rather, it is about creating a space, context, and moment for a certain kind of dialogue. Our hope is that Portals not only connects public spaces around the world, but revitalizes public spaces at home. Even more specifically, we hope it prompts all of us to seek out those moments to converse with strangers unlike ourselves – to put down the iPhone or laptop on the bus or the train and engage the person next to us. Talking to people unlike ourselves is always important, but particularly so today. There are powerful forces driving us deeper into our own communities including widening income inequality, a consolidating mass media, and dwindling public spaces. And dialogues across distance and without pre-determined ends are important for a number of reasons: First, they “create room” and puncture hardened stereotypes of the other. The puncture might not yield harmony or understanding. It may exacerbate disagreements. But at least it adds the vast complexity of a human face. Second, these conversations help us better understand ourselves. It breaks us out of habituated ways of thinking, and enables us to see a greater range of possibility for ourselves. And third, these types of dialogue create the values and narratives of our broader community. When people speak to one another without hope of gain or fear of judgment, but to convey their own truth, authentically, and to listen to someone else do the same, they create their own, unique meaning together, laying the groundwork for our shared societies. In this effort, Portals is just a first step. We have a vision at Shared_Studios for years to come, from Shared_Playgrounds to Shared_Classrooms. Imagine having a true, global study hall where kids in Colorado Springs can call out into the hall to engage kids in San Pedro Sula; or a playground where kids in Beijing and Berlin play naturally together. In this enterprise, more important than the technology, is the shared context. Only if all the sites in the network share a basic understanding of the space we are collectively creating can it retain its essential character. The vision is getting clearer. But disciplining it is always the challenge. How do we fund our growth? How do we consider laws that could limit it? How do we conceive of ownership? How do we maintain a certain context and community norms as we grow? We’re feeling our way through all of this, moving between institutions, with and apart from them, trying to think of Shared_Studios and all the decisions within it as part of a collective, shared creative piece. That is why the shared context is so critical – the associations of purposeless, aesthetics, public space, and art. Only if all the sites in the network share a basic understanding of the space we are collectively creating can it retain its essential character. Art opens space for us to probe essential character – that of others, and our own. It helps reveal. In my case, working on Portals made me look again at the importance of my grandmother in my life. I now realize the gold color I settled on for the Portal is the same color of the small statues of Hindu gods and goddesses Nani kept on her dresser. And the grey carpet that reminds me of safety is the same color and texture as the movie hall Nani and I used to go to when I was a child. And the idea of looking at another human being in isolation, worthy of appreciation just by virtue of existing, reminds me of my grandmother’s faith and the idea embedded in the greeting Namaste, recognizing and loving the divine in another human being, every other human being.